An interesting refit project comes on the market as Melitas Marine send news that they've signed the 48.5m motor yacht Lea for sale. Built in 1973 in steel and aluminium by Anastassiades Shipyard to a design by Diana Yacht Design, Lea (ex-Bellissima) has an enormous interior volume and has had several major refits through her life. 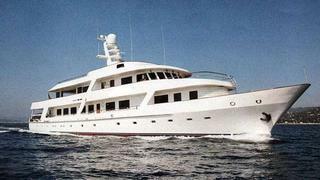 Accommodation is for 12 guests in six large staterooms including a master and VIP suite. Currently lying ashore and nearly completely stripped, Lea would make an ideal refit/rebuild project to serve as a private or charter superyacht and her condition is reflected in her asking price.